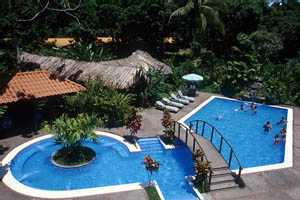 Mawamba Lodge is located on 15 acres in the Northeast area of Costa Rica's Caribbean coast between the Tortuguero Lagoon and the Caribbean Sea. It is the ideal hideaway for nature lovers and people seeking soft adventure. Its beautiful gardens and rustic accommodation blend in perfectly with the exuberant jungle vegetation, exotic birds and wildlife, creating a perfect balance of nature. The lodge features two family-style, open-air restaurants with delicious international and local cuisine, and a pool-bar surrounded by beautiful gardens, where you can enjoy tropical cocktails. The lodge has 54 comfortable rooms with private bathrooms, hot water and ceiling fans. Rooms have either three single beds or one double bed and one single bed. The hotel has the capacity to host up to 100 people.